Jesus is now short of time and has so much more to teach the disciples. Instead of giving them more words to follow, He demonstrates how He wants them to be. 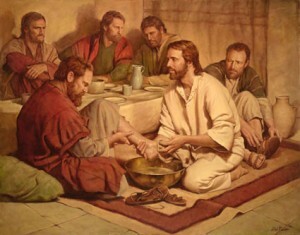 There was never a teacher or rabbi who would have humbled himself like Jesus to wash their friends feet like a servant. No king or lord would get down on his knees before any other person unless they were surrendering. The feet of anyone at the time would have been rough and calloused, muddy and smelly. Jesus is teaching us that in order to follow Him we must be like a servant, and serve God alone. If the Apostles were pushy like the pharisees, demanding like the rabbis or made the people serve them rather than serving God, all that Jesus built would have crumbled like the temple. Unlike the kings, the Apostles were to serve new believers and demonstrate to them what it means to follow Jesus. We, too, are called to be humble and serve others, especially if we are in a leadership position. We gain the attention and respect of others when we show love and mercy to others rather than dominating and suppressing people. Being a follower of Jesus demands that we become a servant to others like Jesus was a servant to us. We can be proud in the love we carry for the Lord, but humble and meek when courting others. We are not to act as the world expects us, but behave the way Jesus has shown us. Finally, we also need to not be so proud to accept help when we are given it. Each one of the Apostles were fully capable of washing their own feet, yet they needed to accept Jesus’ help in cleaning their feet. Allow others the opportunity to also help further God’s plan. We may be fully capable of doing His work on our own, but God calls everyone to be a part of His Kingdom. Do not deny another willing to help that opportunity. Have a servant’s heart and do something for someone else you would normally ask them to do. King of kings, thank you for humbling yourself and loving me so much to take my sins upon the Cross. Show me where I need to be humble and serve others; in my family, work and with my friends. You did not grumble when You were called to serve us, help me not to grumble when I am called to serve. In your name. Amen.